I found this Black Watch plaid jacket on one of my many Target expeditions a few months back. I had been eyeing one from J.Crew, but because of the ratio of #'s of wear vs. price, it didn't really make sense. When I love a piece, but it's pattern or print is pretty distinct, it's not something that I will choose to wear very often, simply because it's too distinct. At $25, this blazer was at a great price point for me, plus the details were an added bonus. The pop of tangerine under the lapel and the seersucker print cuff lining sold me immediately. It's wool and warm, which I appreciate in the arctic temperatures we are having here in Dallas. This particular plaid is rather versatile since it has both navy and black, so I can play off either color. I'm having a love affair with navy and black right now, and can't believe that I didn't gravitate towards it earlier. Those age old "rules" of fashion, i.e. white after Labor Day, patent leather in the summertime, and black and navy is a no-no just don't apply to me anymore and I am so glad they don't! Top: J.Crew Blythe Blouse, color no longer available, but these bright colors are beautiful! Denim: Ann Taylor Knit Denim Skinny Jeans - LOVE! Love it! I found a similar one on major sale at Gap! I'm the same way -- if I'm not going to wear it often it's not worth it! Nice! Gap is one place I never go. I need to check it out! I totally agree with making sure you are going to wear it enough for the price. I do love it though! This one was definitely worth $25 even if I only wear it once a year... Thanks for stopping by!! What an adorable outfit! 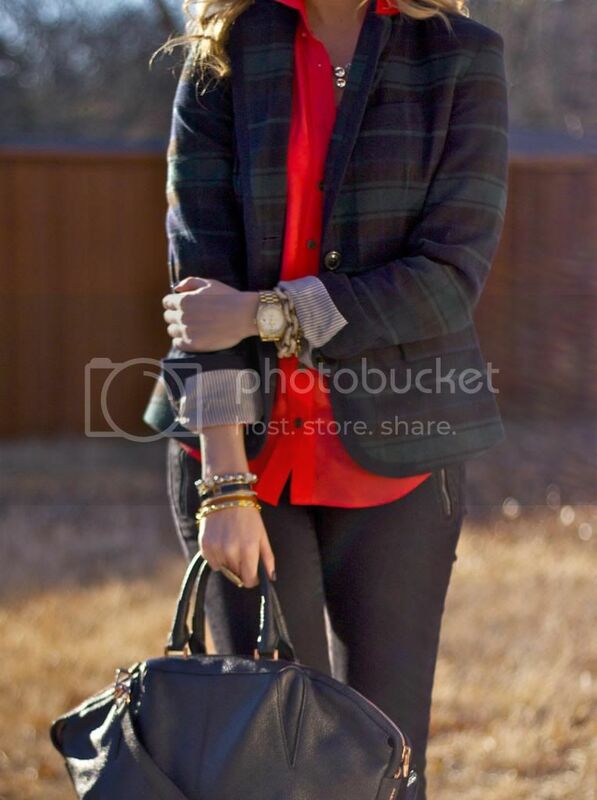 Love the plaid blazer with the red blouse! :) ADORABLE! I love the outfit, especially the blue shoes! !